The East Coast region of the north island has large areas of forest resource nearing harvesting age. 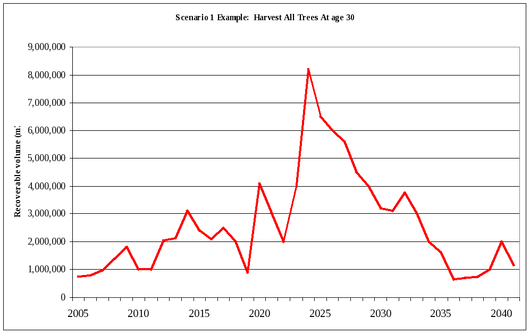 Wood availability forecasts by the Ministry of Agriculture and Forestry show harvesting levels increasing from the present 1.2 million m³ per annum to in excess of 3.0 million m³ per annum over the next decade. 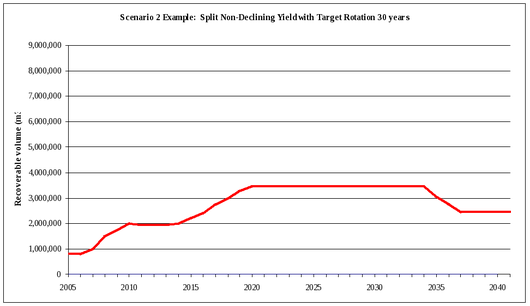 A sustainable harvesting programme of approximately 3.4 million m³ per annum for a period of 15 years from 2020 has been modelled as one possible scenario. The wood is here, and represents a great opportunity for forest owners and the region. To maximise the benefits of the region's forest resource a number of important issues must be addressed now! Developing adequate port and log storage facilities. Commitment from local government to support and promote the forest industry. Eastland Port has recently enjoyed a number of record months with log exports exceeding 80,000 tonnes per month. While this is excellent for the port and district, port facilities as they stand are inadequate for the expected ramp up in harvesting volume. The new Hirini Street bypass diverts traffic away from port operations, adding log storage and improving safety. Upgrade of the port dredge. Purchase of bookends to improve log storage by allowing higher stacking. Installation of debarking plant and anti-sap-stain facility. Increasing the log storage area by removing buildings and Caltex tanks. New weighbridge and gantry facilities. These investments by Eastland Port have been beneficial to the industry but further investment is imperative to meet future requirement of the industry for both log exports and processed wood. 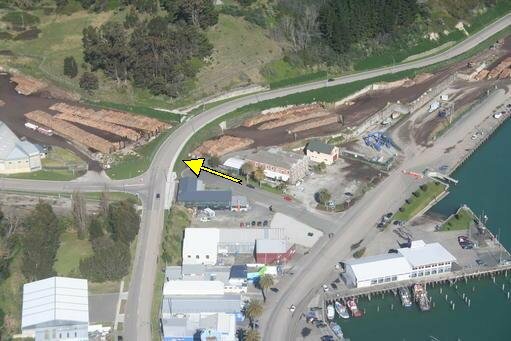 Aerial view of Gisborne port showing dry storage sheds and log storage areas. Development of lower log yard to yield 8,000m³ storage. Development of upper log yard to yield 15,000m³ storage. Ongoing sealing of log yards enabling higher stacking of logs. Development of three hectares of off-port log storage. New log scaling station with three scaling bays. New port entry and exit to improve internal traffic flows. Channel dredging to 10.5 metres to allow full vessel loading. Development of two log ship berths. 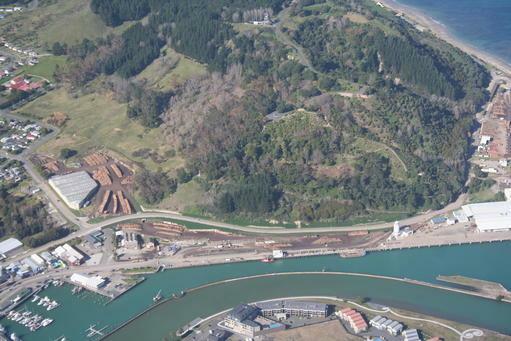 Aerial view of Gisborne port showing additional log storage areas - Kaiti Hill is in the background. 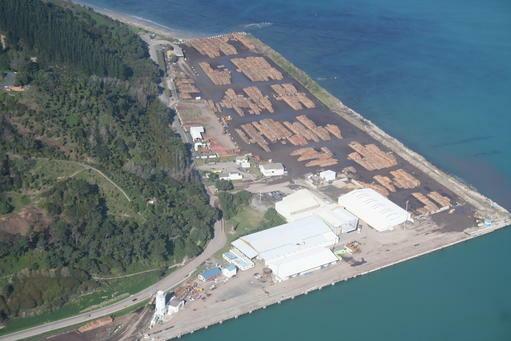 One issue for Eastland Port is the volatile nature of the log export trade. They are reluctant to invest in new facilities if they might sit idle for long periods. On the other hand, these are not quick-fix solutions and you can't wait to the last minute to implement them. One of PF Olsen's roles is to ensure effective lobbying for sufficient investment to allow efficient export operations to be carried out. The forest industry believes that reclamation will be required to handle the increased volumes. Off-port log storage is expensive costing $7.50 more per tonne than storing logs directly at port. The cost/benefit of enhancing off-port storage versus reclamation needs to be re-examined, as does the ridiculously high cost associated with consents for reclamation. The Regional Roading Fund from central government has been a tremendous boost for the district. Many of the key harvesting routes have been upgraded to allow safe transporting of logs to markets and Gisborne port. There are still a number of road projects and bridge upgrades to complete with the remaining funding expected to cover most of the required work. Ongoing maintenance of these roads is important and is the responsibility of local government. This was one of the requirements for the regional road funding to be granted. The Hirini Street bypass was made possible by the Regional Road Fund and diverts traffic away from port operations, adding log storage and improving safety. As PF Olsen frequently advocates, a stronger domestic log processing sector for the Gisborne/East Coast region (and NZ generally) is very desirable. Prime Sawmills has significantly reduced its operation in Gisborne largely due to the strong NZ dollar reducing export returns along with weak market demand for product. Hikurangi Forest Farms is still progressing with their large mill facility to be commissioned in 2011. This mill will take 900,000 tonnes annual log input when fully developed which is a significant proportion of the district's harvest. As the wood flows increase from the region, there will be greater opportunities for new investment in processing. The ramp up in wood flow comes mainly from smaller forest owners. Wood flows from Juken Nissho, Hikurangi Forest Farms and Ernslaw One are relatively static. Significant increased harvest from PF Olsen clients, forest investment companies and syndicates including Forest Enterprises Ltd and Roger Dickie will occur over the next decade. This wood will be available to supply and attract new processing. Local government and Eastland Infrastructure Ltd must ensure that infrastructure such as power and industrial zoned land is available for potential investors. Long-term council plans should continue to recognise the importance of forestry for the region and implement planning to welcome and assist new investment. PF Olsen continues to work with potential processors looking to establish new mills in New Zealand. In addition to viable projects, would-be NZ-based processors are also looking for receptive communities in which to invest. PF Olsen will continue to promote the East Coast as an area of huge potential given the rapidly increasing wood resource. Gisborne forest owners are very reliant on export markets. The East Coast region currently has limited domestic log processing; much less than its neighbouring Central North Island region. Hikurangi Forest Farms is building a large scale facility and Juken NZ has an established and well-run mill producing plywood, laminated veneer and sawn products. As mentioned above Prime Sawmills is struggling. All these operators do, or will, largely use their own resource to supply logs to their mills so the increased wood flows will still require exporting should further domestic processing not occur. Log export prices are highly sensitive to the NZ$ exchange rate and ocean freight costs. There are no easy solutions to these price drivers. PF Olsen's strategy is to choose reliable and efficient export sales channels that can minimise the negative impact of adverse movements in currency and ocean freight rates, and to have an unrelenting focus on developing more efficient supply chains from forest to market. Lobbying for better forestry servicing infrastructure is a critical aspect of this role. The argument is advanced that a volatile currency is a product of a small and open economy and cannot be subject to any controls. However, the reality is that the volatility in the currency is not caused by trade, but driven by speculative and short term movements of capital from off-shore investors and hedge funds. These forces were not at play at the time the NZ economy was opened up. If you accept that a less volatile currency is in the interests of the NZ economy then the issue for the government is how to achieve this. If this can be achieved the export sector will have a much sounder basis for investment and growth. If not, and we continue to be subject to a wildly fluctuating currency, then the inevitable outcome for forestry will be continued wide swings in activity levels and required harvesting infrastructure (road, port facilities and logging and log transport contractors) and the high associated individual and societal cost. It also means that the quality and availability of harvesting infrastructure will be severely constrained when the wood flows need to increase. Ocean freight rates have also fluctuated widely based on supply/demand balances. Very high freight rates last year were caused by unprecedented demand for shipping from China, a lack of new ship builds and an ageing fleet. Freight rates plummeted in early 2009, a result of the global recession and to a lesser degree some new ships entering the market. However, at the same time, export log prices in Asia plummeted, muting NZ at-wharf-gate price rises. In recent times ocean freight rates started increasing and they remain volatile. Cooperation with shipping amongst NZ exporters can help manage costs but in addition, NZ Radiata pine needs to be aggressively marketed in Asia and its features of affordability, ability to treat, machine-ability and high strength-to-weight ratio aggressively marketed. There is a unique opportunity to grow significant market share for Radiata pine as the traditional log supply areas (Russia, SE Asian, N America) become less competitive. The East Coast region provides a great opportunity for the forest industry and community. There is a great deal of work to do to ensure that these opportunities are maximised. The Eastland Wood Council and individual forest companies are addressing industry issues but require the continued support of local and central government.